Ba Da Da Hei Shan Pu'er Cha was produced using rare wild arbor tea leaves harvested during early spring season from Ba Da mountain areas in Xishuangbanna region. This mountain is home to some of the oldest trees in the world, including the ancient 1,700 years old "King of Tea Tree". The tea was originally stored in a bamboo basket packaged at 6.5 kilograms per basket. J´ai bien aimé... U thé de tous les jours. 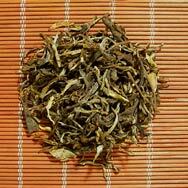 This is a fine Pu-Erh tea, strong tasting yet with subtle notes, a very interesting brew. I really enjoyed this tea after I´ve gotten used to it´s bitterness. Slightly fruity at first followed by a bitter earthy taste. This raw pu-erh is really nice, earthy and slightly bitter but in a good way. Has a hint of euchalyptus that I´ve come to appreciate in good sheng. This raw pu-erh is really nice, earthy and slightly bitter but in a good way. Totally unintresting. Drink it hardly. Totally unintresting. Drink it hardly. Totally unintresting. Drink it hardly. Totally unintresting. Drink it hardly. This pu-erh has a bitter, mineral, earthy taste with a medium body. Hints of honey or fruit are apparent too. The leaves are intact and nice looking. I do not drink a lot of pu-erh, but this BDDHS is is a good introduction to this class of tea. 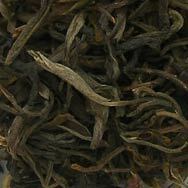 I would recommend this pu-erh for its assertive qualities and its low price. I must say I disagree a little bit with the previous rating of this mao cha. Is ok, and for the price you cant really complain. The raw tea has a very nice smell very floral. The tea has a pleasant bitterness. The leaves are almost perfect small unbroken nice popping vanes. Though there are very old trees on ba da da .Mt these leaves don’t come from them the viscosity is just not there. The first two extractions have some complexity but after that all you can taste is the bitterness. If you want a better mao cha you can buy them but you have to be willing to pay.